Keep them snacking and toasting your affection with a gift hamper that's sure to satiate their sweet tooth. 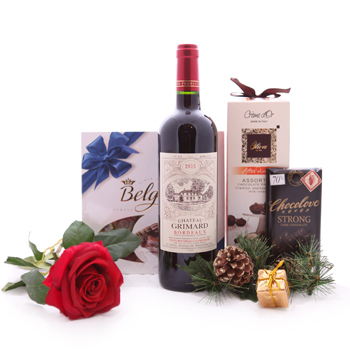 A bottle of Imported Red Wine (750 ml) is accompanied by Belgian or Swiss Chocolate, a single Long-stemmed Red Rose, and more. Perfect for their birthday or even to ask them out on a first date. Send Red Wine and Snacks to someone you want to impress today.